The world is at war with God (James 4:4) … This means, of course, everyone who is apart from God! Islam is not serving the God of the Bible therefore Muslims are apart from God! The whole system of things in our society of is anti-Christ and anti-God. Abraham was the friend of God (James 2:23); Lot was the friend of the world. Lot ended up in a war and Abraham had to rescue him (Genesis 14). Are the Biblical End-Times upon us…? We believe that they are and we have clear choices to make! We can choose to be like Abraham or like Lot! The Third World War has begun, in spite of the fact that few people recognize it. While the West is asleep radical Islamists in Iraq and Syria and militant Muslims are stealing the headlines and if we don’t wake up - it is not long before we see them forcing their ideology and Islamic shariah law on the West and the world for power to form their 7th Century Caliphate. You can’t defeat what you can’t define! We must fight the evil of Islam but to do so we must name it what it is! Whilst Yeshua (Jesus) did proclaim in Matthew 24 that no one knows the day or hour… He also said to the Disciples to watch for the signs of His return …and also that we NOT be ignorant of our times too! People today are of the mind-set that the events of the Old and New Testaments all happened back in the “Biblical days” of human history. They fail to grasp the awesome truth that we are still living in Biblical days. They never ended. What will yet happen on the face of this Earth in the years to come has already been prophesied and penned in the Bible. There remain things written in the Bible, in both the New an Old Testaments, that are yet to come to pass! In fact, we believe that this is the greatest time to be alive. There could NOT have been another time for the Lord’s Second Coming since Israel was not back in their land until 1948! End-Time Prophecy always is connected to Israel …and Israel is the anvil on which nations will be judged! Prophetically speaking, we are living today on the far side of the valley of the Church, time wise, and quickly moving up the mountain slope towards the coming of the Antichrist and the great Day of the Lord; the end times of God’s dealing with the Jews, His chosen people. Although 1948, the year when Israel became a state, would seem a natural benchmark for the start of the latter times of Biblical days, we believe a much better benchmark emerged in 1979 when the Iranian Revolution catapulted the land of ancient Persia back onto the global political stage. The Iranian Revolution inspired an exponential rise of Islamic fundamentalist sentiment against the west; an angry wind that began to blow with increasing velocity across the Middle East and the larger Muslim nations and Islamic world. When the Islamic world saw that Iran could blatantly snub its nose at US Obama Administration and the powerful West …and get away with it, others quickly followed! The subsequent Iran/Iraq war, the rise of Al Qaeda, the attack on 9/11 in America, the Gulf Wars, the wars in Afghanistan and Pakistan and the rise of ISIS and the so-called “Islamic State” all directly or indirectly precipitated from this “ground breaking” event. The Arab Spring uprisings in the Middle East and North Africa and the increase in strife between Sunni and Shiite Islamic factions across the Muslim world all play a part of this End Time puzzle. And Iran is an active political driving force in this phenomenon. Iran is Biblical Persia and, in retrospect, we can now see that the emergence of Iran as a world power, and a modern-day growing global nuclear threat, is prophesized in the book of Daniel. The prophetic seal on the book of Daniel is unsealing right before our very eyes. The Church Age is rapidly drawing to a close. The root cause of every war, internal and external, is rebellion against God… At the very beginning of Creation, mankind beheld perfect harmony, but sin came into the world and this led to conflict. Sin is lawlessness (1 John 3:4) and lawlessness is rebellion against God. It is an error to say that God never supports a war. In a world filled with evil people, sometimes war is necessary to prevent even greater evil. If Hitler had not been defeated by World War II, how many more millions would have been killed? Today the world is facing a great evil in the form of world leaders and those who encourage, support and kill in name of Islam! How does a believer declare war against God…? By being friendly with God’s enemies (James 4:4-10) and the enemies of Israel. James names three enemies we must not flirt with with if we want to be at peace with God; the world, the flesh and the Devil. Friendship with the world is compared to adultery! As a believer we are “married to Christ” (Romans 7:4) and must to be faithful to Him. The Jewish Messianic believers would understand this picture of “spiritual adultery” because the Prophets Ezekiel, Jeremiah, and Hosea used it when rebuking Judah for her sins (Jeremiah 3:1–5; Ezekiel 23; Hosea 1–2). By adopting the sinful ways of the other nations and by worshiping their “gods” the nation of Judah committed adultery against her God. The world is the enemy of God and whoever wants to be a friend of the world cannot be the friend of God. The flesh at war with God… This refers to the old nature we inherited from Adam, in the Garden of Eden …that which is prone to sin (Galatians 5). The flesh is not the body. The body is not sinful; the body is neutral. The Spirit may use the body to glorify God or the flesh may use the body to serve sin. When a sinner yields to Yeshua (Jesus Christ), he or she receives a new nature within, but the old nature is neither removed nor reformed! Living for the flesh means grieving the Ruach HaKodesh - the Holy Spirit of God who lives in us. Just as the world is the enemy of God the Father …so the flesh is the enemy of God the Holy Spirit. Just as there is a holy, loving jealousy that a husband and wife have over each other and rightly so …the Spirit within jealously guards our relationship to God and the Spirit is grieved when we sin against God’s love. Living to please the old nature means to declare war against God. “The mind governed by the flesh is hostile to God; it does not submit to God’s law, nor can it do so.” To allow the flesh to control the mind is to lose the blessing of fellowship with God. Abraham had a spiritual mind; he walked with God and enjoyed peace. Lot had a carnal mind …he disobeyed God and experienced war. “The mind governed by the flesh is death, but the mind governed by the Spirit is life and peace.” (Romans 8:6-7). God hates the sin of pride (Proverbs 6:16–17) and He will chasten the proud believer until he is humbled. We have a tendency to treat sin too lightly, but sin is serious! One mark of true humility is facing the seriousness of sin and dealing with our disobedience (Psalm 34:18; Isaiah 66:2; Psalm 51:17). The Devil is at war with God… God wants us to depend on His grace, but the devil wants us to depend on ourselves. So we see that the world is in conflict with the Father; the flesh fights against the Holy Spirit; and the devil opposes the Son of God. Pride is Satan’s great sin and it is one of his chief weapons in his warfare against the saint and the Saviour. God wants us to be humble; Satan wants us to be proud. “You will be like God,” Satan promised Eve and she believed him. A new Christian must not be put into places of spiritual leadership “lest being lifted up with pride he falls into the condemnation of the devil.” (1Timothy 3:6). Satan hates the Jews with a passion for several reasons and he is using Islam and anti-Semitism to achieve his purposes… The Jews are the Chosen People of God. God used them to provide the Scriptures to the world and it was through them that the Messiah Yeshua came. God has promised that He will bring a great remnant of them to faith in His Son at the end of the Tribulation. Antichrist at war with Jews and Christians… There is going to be another holocaust during the latter half of the Tribulation. When Satan is cast down to earth, he will possess the Antichrist (Revelation 13:2) and inspire him to annihilate all the Jews. This is the reason that Yeshua (Jesus) referred to the last half of the Tribulation as “the great tribulation” (Matthew 24:21) …not because this half will be worse than the first half, but because the wrath of Satan will be focused on the Jews. Some of the Jews of Israel will flee to a place in the “wilderness” where they will be supernaturally protected by God (Revelation 12:13-14). Many believe this hiding place will be the Ancient City of Petra, located inside a box canyon in modern Jordan. There is good reason for this assumption because Daniel 11:41 says the Antichrist will be prevented from conquering Jordan when it is part of an End Time rebellion. But Zechariah 13:8 indicates that two-thirds of the Jewish people will be killed by the Antichrist during this time and Revelation 12:17 says the Antichrist will also war against the “offspring” of Israel …namely, those “who keep the commandments of God and hold to the testimony of Yeshua.” This is a reference to all those who accept Yeshua as their Lord and Saviour during the Tribulation, both Jews and Gentiles. Revelation 7:9-14 pictures a great multitude of martyrs in Heaven, so great that it cannot be counted. They are identified as; “the ones who are coming out of the great tribulation, and they have washed their robes and made them white in the blood of the Lamb,” Revelation 7:14. So the Antichrist will be very successful in his war against the Jews and the Saints, but he will fail in his ultimate goal of annihilating all the Jews. For we are told repeatedly throughout the Scriptures that a great remnant of the Jews will live to the end of the Tribulation at which time they will receive Yeshua as their Messiah (Isaiah 10:20-23; Zechariah 12:10; Romans 9:27-28; Romans 11:25-26). What about the concept of a “holy war”? It is most commonly expressed as a war justified on the grounds of religious differences. As typically understood, this concept is neither taught nor encouraged by the Bible. The ancient Israelites were never given a broad mandate to wage war on behalf of their faith, though they were given a specific time, place, and region which they were instructed to conquer. Yeshua (Jesus) explicitly contradicted the holy war concept through both His teachings and His example (Matthew 26:52-54; Matthew 5:9-10; John 18:36; John 15:18-21; Acts 5:25-26; Romans 13:4-5). The concept of “just war” meaning justifiable war waged by a legitimate government, is not the same as a “holy war.” Critics sometimes claim that “holy war” is encouraged in the Old Testament. However, the nation of Israel was given a mandate only to conquer the land of Canaan (Numbers 31:2, 34:2; Deuteronomy 20:16-17). This command was for a specific place, time, and people, not an endorsement of religious warfare. Nor was the conquest of Canaan made on the basis of religion, in and of itself. On the contrary, God repeatedly stated that this conquest was due to the wickedness of the Canaanites, not the merit of Israel (Deuteronomy 9:4-6; 1 Samuel 15:18). Historically, this is exactly how the nation of Israel interpreted these commands. No attempts were made to conquer other lands or to expand that territory through combat! The occurrence of “holy war,” historically speaking, is rare. Historians note that more than 90 percent of the wars fought in human history had no religious motivation. The remaining 7 percent of conflicts account for about 2 percent of all deaths in war. Islam accounts for more than half of these religious wars, despite existing for only about 1/3 of human history. 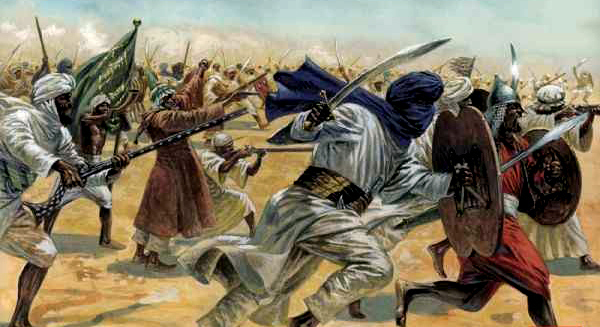 In Islam’s first three centuries, its growth was fuelled by armed conquest. If there’s any reason the concept of “holy war” exists, it’s fair to say that reason is ISLAM! The Bible maintains a strict emphasis on God’s righteousness and mankind’s fallibility. Yeshua (Jesus) preached a message of peace and lived it out perfectly! Historically and theologically, “holy war” has never been a part of Biblical Christianity! The Crusades were done under the banner of the Catholic Church and instruction of the Pope not the Bible! Islam is at War at Christianity…. Christians are being murdered around the world at a rate unprecedented in history. Even during the time of the cruellest Roman emperors, persecutions were occasional, limited affairs - violent in their own way, deadly but brief. We are now facing a long-term, sustained threat in the form of radical Islam. How can we expect to command respect or instil fear in our enemies when the powerful USA and their allies are too cowardly to face an enemy man-to-man? They restrict the military to using drones and cruise missiles, a strategy that has never worked in all the ages of distorted warfare! Instead of meeting the jihadist face-to-face! Even the president of Iran found this cowardice and worthy of ridicule and makes America a laughing stock since their current President Obama is weak and not even untrusted by allies in the West! Islam only responds to strength! The growth of Islam and especially “radical Islam” can be summarized as one word, JIHAD! Rather than protecting Judeo-Christianity Obama and the Western political left are protecting Islam… Calling “good evil” and “evil good!” They are silent when Christians are being slaughtered in the Middle East …and in fact call anyone who speak up against this evil - Islamophobia! Whilst under Obama Islam is not only protected …but Daesh - ISIS or like he loves to say ISIL, was not only created under his leadership but has also progressed in their 7th Century radical Islamic ideology of a Caliphate and has forever changed or altered the Middle East! We take comfort in the fact that God sets up kings, and takes them down… just as we read in the Daniel 2:21! The bible clearly teaches that it is God and not man who appoints rulers over the affairs of men (1 Samuel 8). All through the bible we see God set up kings for a purpose …and take them down for a purpose. “Let every soul be subject unto the higher powers. For there is no power but of God: the powers that be are ordained of God,” Romans 13:1. Sometimes God raises up a ruler to bless His people, like He did with King David. And sometimes He sets up a ruler by whom the people will be judged, as He did with Saul. But God does not only set up kings over His own people (Israel), He sets up kings over all people. Such was the case with Pharaoh of Egypt: “For the scripture said unto Pharaoh, even for this same purpose have I raised thee up, that I might show my power in thee, and that my name might be declared throughout all the earth,” Romans 9:17. Now, the story of Pharaoh and the people of Egypt is a great story because for a long, long time Egypt prospered under the rule of Pharaoh like no nation on earth ever had before them. They were the America of the ancient world. Egypt grew in size and wealth and in might and in power till no other nation could stand against them. Just taking a casual glance on the outside of Egypt you would think that they had God’s blessing, but they did not! Egypt was a wicked, godless nation who enslaved the Jews for four centuries, and made human sacrifices to their gods. And after 400 long years of oppressing God’s chosen people, God’s patience and long-suffering had come to an end! Just like Pharaoh Obama has caused much evil not only to Israel, his own nation America, the Middle East… but also to the world… is this all about to change soon? Is God removing His Hand of protection from America? There are many questions and only God Almighty has the answers! We all know the story of how God called Moses to be the leader of the Jews… To lead them first out of the land of Egypt, and then into the land of Promise – Israel! Moses obeyed God and went and confronted Pharaoh and warned him what God had told him to say. When God commissioned Moses to warn Pharaoh, He knew full well that Pharaoh would ultimately reject what Moses would tell him… but just as God raised up Moses to tell His message to Pharaoh …God also raised up Pharaoh to hear it and be warned! “And the LORD said unto Moses, Pharaoh shall not hearken unto you; that my wonders may be multiplied in the land of Egypt,” Exodus 11:9. Now, God had also raised up Pharaoh to be a mighty king but Pharaoh’s heart was wicked and would not obey the servant of the Lord. So there came a day, when God was about to free the Jews from slavery, that God also used Pharaoh for a mighty purpose knowing that Pharaoh would never repent – though he was given multiple opportunities. But, God chose to use him and Moses …to show the world the power of the God of Abraham! This demonstration of power would have markedly and drastically outcomes that affected a whole nation! In Moses He showed His power and glory by setting the Jews free in a way that would be retold throughout time for all eternity. In Pharaoh God showed His power and glory by drowning Pharaoh and his entire army when the walls of water came crashing back down. 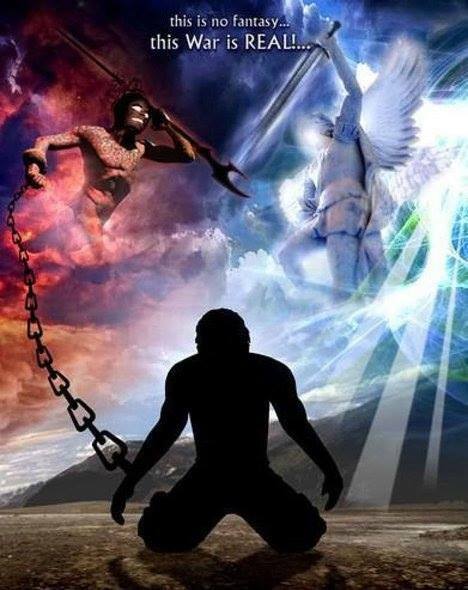 Both men raised up by God and both men put into their position of authority by God …with one man winding up in Heaven, and the other still burning in Hell (Exodus 14:27-28). What’s the take-away here…? That God judged an entire nation for the wickedness of one man (pharaoh) - the leader of a nation who refused to repent. We all need to remember that! It is no coincidence that the Middle East is a powder keg, awaiting only the proper spark to explode and it is no coincidence that radical Islam has become the global terror threat! It is no coincidence that Iran is threatening to wipe the nation of Israel off the map …and it is no coincidence that Israel exists as a nation, once again back in most of the very same Biblical lands that God deeded to Abraham thousands of years ago. None of this is coincidence! It is the fulfilling and unfolding of God's Word and is setting of the stage for the fulfilment of coming events written about in the book of Revelation. The preservation of the Israelis as an identifiable people, in spite of the proverbial “wandering Jews” 2500-year Diaspora from the promised land, and the establishment of Israel in 1948, constitute irrefutable proof for the existence of the “God of Abraham, Isaac and Jacob” and the validity of His Holy Word. Therefore, to insist that Israel no longer has any claim to her ancient homeland, and that her return thereto is a mere coincidence, denies one of the most persuasive arguments for belief in God and the Gospel, dishonours Him and His Word, and is not only illogical but evil! Barack Hussein Obama at war with God and Israel… As America grew as a nation, they became mighty like to no other nation. But, over time as they grew, they began to forget and especially under Obama and his Godless Administration. They forgot that they were blessed by God who had created them, and to be a protector of Israel and their Judeo-Christian values. God had sustained them, and had done such mighty deeds demonstrating His power to bless America. They sing “God Bless America” and even their money (dollars) say; “In God We Trust” …but somewhere along the line since 2008 the world watched as America stopped trusting and seeking God’s face and began to trust in their own strength. Obama stands openly for the things that are against God, and he takes great pride is doing so…! Obama was the king America choose not once but twice! He is so enthusiastically in favour of sacrificing babies on the altar of Planned Parenthood that when he was a state senator he voted 3 times against the “Born-Alive Infants Protection Act.” The bill recognized babies born after attempted abortions as persons and required doctors to give them care.’ Obama voted to withhold that care – three times. Under his recently-passed Obamacare bill, abortion is now taxpayer-funded. That means that the leftist America shares in the killing of these babies, and their blood is upon them. Obama openly supports the gay, lesbian and transgender rights and he campaigned with these things as the reasons why Americans should vote for him and they re-elected him to the office of president – twice! This may seem harsh but we must remember even here in South Africa we are not immune to this! We have many God-fearing, Bible believing American friends and know that the past 7 ½ years has been extremely painful for them and want to encourage everyone reading this article to pray for America. What happens in the USA …definitely affects Israel …and in fact every one of us - no matter where God has placed us! God bless America! ISIS at War with (Yahweh) God and Israel…. When referring to the Muslim terror super-group ISIS, US Obama will always use the term ISIL instead of their former name Daesh or ISIS or current name Islamic State. Have you ever wondered about that…? We have! In the near exact middle of the nations that comprise the Levant, guess what you see…? Come on, guess…. It all has to do with the nation of Israel! 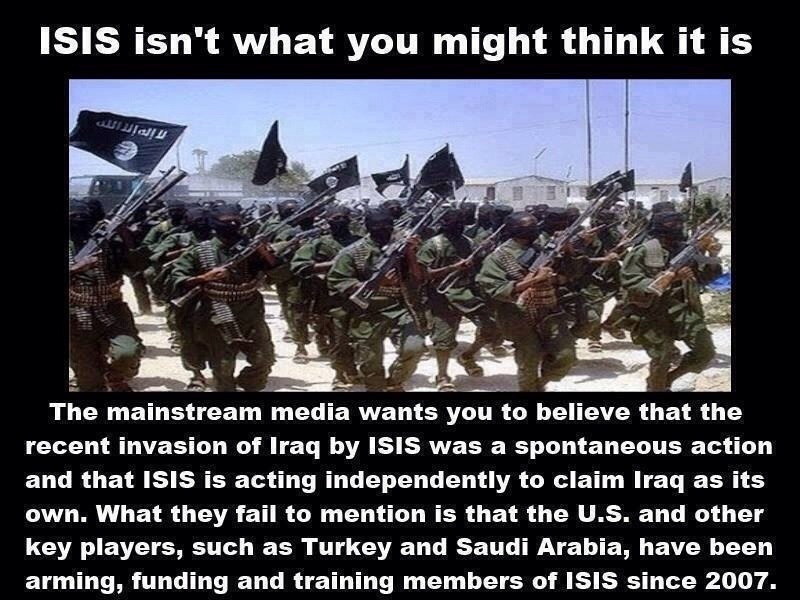 ISIL stands for the Islamic State of Iraq and Levant. Now, to us Westerners we don’t really make much of a distinction, do we? No, honestly from our perspective it’s all about the same. But, how would a Muslim living in the Middle East view it? Just what is the Levant anyway? 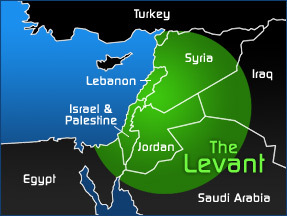 The geographical term LEVANT refers to a multi-nation region in the Middle East. It’s a land bridge between Turkey to the north and Egypt to the south. When Obama refers over and over to the newly formed Islamic State in and claimed from Iraq and Syria …he is actually sending a message to Muslims all over the Middle East that he personally does not recognize Israel as a sovereign nation or a nation created by God Almighty Himself. What Obama is in fact coding in his message is that the territory belongs to the Islamic State who in turn believe it belongs to their moon god, Allah! Now you know why Obama tells America and the world that he has no plan, no goal and no stated aim for dealing with ISIS …But then he does have a plan, and it’s a really nasty, evil one that will bring him at war with God, Yahweh! Obama’s plan is to drag his feet for as long as he can, doing only the bare minimum to buy ISIS as much time as possible to make as many gains as they can during his presidency as the leader of the World. But, he has one who is more powerful than him to content with and God’s judgement is surely coming! “And it shall come to pass on that day that I (God) will make Jerusalem a burdensome stone for all peoples; all who bear it shall be gashed, and all the nations of the earth shall gather against it,” Zechariah 12:3. Islam at war with God… The key to understanding ISIS is a small town lying in Northern Syria about 40 kilometres north-east of Aleppo and the name of the town is “Dabiq” which is synonymous with a concept of Islam. It is under that same name in Islam that discusses a much awaited battle between Islam and Christianity that will mark the end of the world. ISIS has made several claims that it wishes to quickly usher in the Biblical “Armageddon” or as Muslims refer to it as “Malahim.” Dabiq was a site of a battle in 1516 in which the Ottoman Turks defeated Mameluke Sultan. In the Islamic Hadith (collection of Islamic writings) the second most important to their Quran, relating to Muhammad and his so-called quotations it is written in there that “Dabiq” is one of two possible locations where “invading” Christians will be take place against “defending” Muslims and that this battle will be a victory for Muslims. Whilst all this is happening Western leaders are treating ISIS like just another terrorist group! This is far from reality of what really is at stake... all the while ISIS continues to grow forming their 7th Century "Islamic Caliphate." They are blind to "Dabiq" and in fact some just turn a blind eye to Islam! Recent events are alarming as we witness a genocide of Christians in the Middle East. Under the current US Obama Administration – "America speaks loudly but with NO voice OR power!" The concept of the Antichrist is a Biblical figure who many believe will be revealed before the Second Coming of Yeshua (Jesus). In 2 Thessalonians 2:3-4 descries a rebellion in which "the man of sin" would be revealed – also described as "the son of destruction" who opposes and exalts himself above all that is called God or is worshipped so that he sits as God in the temple of God, showing himself as God. Revelation 13:5-8 describes a parallel detail about the Antichrist and describes him as "a man of sin" referenced in 2 Thessalonians as "the beast." Although the Antichrist will rise to world power in Europe through cunning, deception, and intrigue (Daniel 8:23), he will have to resort to military power to conquer the world. Asia, Africa, and South America have spent too long casting off the shackles of European colonialism for them to suddenly surrender their sovereignty peacefully to a new European dictator …regardless of how brilliant and charismatic he may be! We are told in Revelation 13:7 that the Antichrist will ultimately achieve "authority over every tribe and people and tongue and nation." Therefore, this authority can only be achieved and forced on by war! Revelation 6:8 records the outbreak of this world war and result in the death of one-fourth of humanity, or 1.5 billion in today’s terms. The War of Psalm 83 results in the destruction of the inner ring of Muslim states around Israel. The War of Ezekiel 38 / 39 produces the defeat of the immediate outer ring of Muslim states. But, the vast majority of all Muslims live outside the Middle East, the largest Muslim nations being Indonesia (201 million), India (144 million), Pakistan (140 million), and Bangladesh (115 million). These nations are the ones who are most likely to produce the strongest resistance to a Western, non-Muslim dictator, and they will be destroyed either in this war or the one that follows it. Thus, we believe God is going to use the Antichrist as His hammer of wrath to destroy Islam…. And, may Is it be soon that we see the fall of Islam! 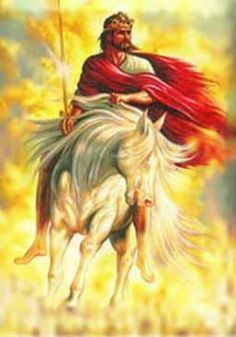 The Battle of the Great Day of God Almighty… in Revelation 19:.7-21, with Yeshua (Jesus Christ) as the righteous Warrior and we see Him coming to do battle with the host of Satan's armies in "the battle of Armageddon," but which in truth is a war of the great day of God Almighty. This war is necessitated by the fiendishly evil ambitions of humankind and their evil source of power, Satan! Our Lord Yeshua tells us in Matthew 24:27-31 when this battle will take place. The Glorious Appearing of our Lord will take place …immediately after the distress of those days! That is, at the end of the Tribulation and before the Millennium. Our Lord will time His coming at the most dramatic point in all history. The church will be spared from this when the Antichrist, the False Prophet, and Satan will inspire the armies of the world to invade Israel in a gigantic effort to rid the world of the Jews and to fight against Christ! Armageddon means "Mount of Slaughter" and refers to the beautiful valley to the east of Mount Megiddo. The word "battle" here literally means "campaign" or "war." No war has ever been won by a single battle! In fact, it is possible to lose a battle and still win a war. The war of the great Day of God Almighty takes place in a single day, and the Battle of Armageddon will be just one of the battles of that war. In Joel 3:2, we read… "I will also gather ALL ‘nations’ (Hebrew meaning ‘goyim’ a word for gentiles) and bring them down to the Valley of Jehoshaphat (means – ‘the Lord judges’) and I will enter into judgement with them there on account of My people, My heritage Israel, whom they have scattered among the nations; they have also divided up My land (Israel)." Speaking of the judgement of nations at the close of this present age, God says; "I will judge them on the basis of how they have treated the Jews and the land of Israel!" Here’s an important point to remember and it’s the principle of God’s blessing and God’s judgement… (1) God blesses the Jews directly. (2) God blesses the Gentiles through the Jews. All of us that are not Jewish owe every spiritual blessing we have to the Jews; our Lord Yeshua (Jesus) was a Jew, the Disciples, the Prophets, the Apostles all but Luke were Jewish, our Bible – New and Old Testaments. (3) God judges Jews through Gentiles (we see that throughout the Old Testament). (4) God judges Gentiles directly! The Second Coming of Christ becomes clouded in confusion if we fail to remember that the Lord comes in a different and specific manner for "Jews," "Gentiles" and the "Church of God." For His bride - the Church, He comes secretly to "rapture" her to His Father’s house of many mansions where He has prepared an eternal dwelling place for her. For Israel, in the midst of God’s judgment for her rejection of Messiah, surrounded by the armies of the world and about to be destroyed. He comes visibly in power to rescue her, judge her Gentile enemies, and establish the Millennial kingdom with headquarters in Jerusalem. May God help us to "love His appearing," and witness with a clear voice concerning these soon coming events. 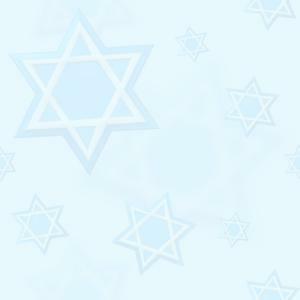 May we always love and support His people the Jews and land of Israel! We most sincerely believe that God WILL bless you for your faithfulness and love for His land and His chosen people. God’s Word is true! He IS watching to see how the nations are treating His people. God will have mercy on Israel through Gentile believers acting as mediators towards them… This is one of the most amazing revelations ever given to the church – an opportunity to do something that carries the highest priority in the heart of God. Yet… sadly, so few have seen the potential and the rewards of serving God in this manner - as agents of mercy to Israel and the Jewish people! Israel was and still is despised today… and a despisable nation continually turning away from God but nothing ever altered the purpose of God for that nation. The despised element is always a noticeable element in the purpose of God. When the Saviour of the world came, He came of that despised nation; like Israel… He Himself was "despised and rejected by men," …and there is that despised element, "…things that are despised God has chosen," 1 Corinthians 1:28. Now more than at any time is the time to support Israel and the Jewish people - the Lord’s Brethren! We are witnessing the nations and people turning their backs on Israel. Please your support is critical! Thank you!